Last weekend saw us make another visit to Harrogate for the National Finals again, but this time in the 1st section, a much tougher task, we were given 11th place out of a line up of 17 bands. This of course was a bit disappointing, but we didn't play our best on stage. It wasn't a bad performance but not up to the standard we had been achieving in our last couple of rehearsals,,, well thats banding. 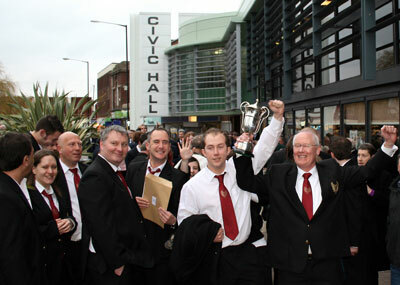 we now look forward to the qualifiers next March in Bedworth. 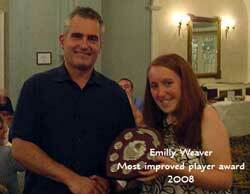 The Saturday night was a band dinner where the awards were made by our MD David Maplestone, As the most improved player of the year Dave selected young Emilly Weaver on second cornet. 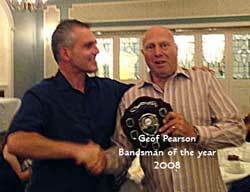 As bandsman of the year Dave selected Geoff Pearson on solo trombone for his sterling leadership throughout the year. Our solo cornet, Lisa Jenks received a special mention for her dedication and leadership in organising all of the band events through the year. October 2008 Were sad to announce that Sara Oberland is leaving our ranks, Sara has only been with the band a short while, but has been an asset on second cornet whilst she's been here. Sara and her husband are going to live in Dublin, so we wish them all the best for the future. Ironically their new house name is "the Phoenix" and is near Phoenix park in Dublin. November 2008 Following our disappointment at Harrogate and the fact that we were unable to go to Pontins, we were determined to attend the WMBBA contest at Leamington. We chose as our test piece, the very moving and evocative piece by Eric Ball, "Resurgam" which means "I shall rise again", we felt this quite apt for Phoenix . Whilst there was a relatively small field, we played well off No 1 draw and the adjudicator, Major Peter Parkes, gave us first place with 192 points and a clear 2 points more than the second band. Our principle cornet Lisa Jenks won the prize for the best soloist, so well done Lisa. We are now looking forward to consolidating our place in the first section in 2009.
audience to Resurgam which is a favourite piece in the SA as it was composed by Eric Ball who was a staunch salvationist himself. £800 for the band funds.----- well done everyone.